Gorgeous and sweet teacup! I love the cookies too, wish I had some right now with some tea with you. Thank you for hosting, such lovely party. Have a nice week. 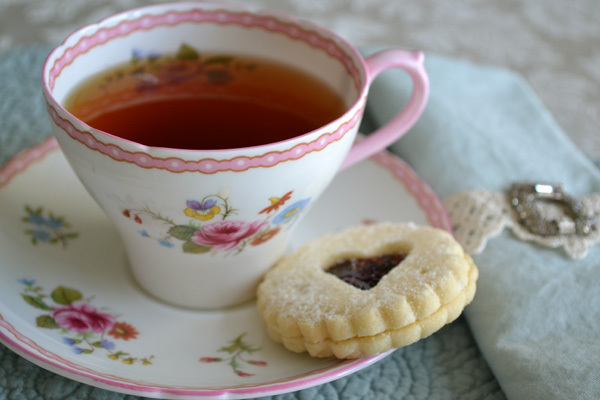 Darling teacup and perfect setting + sweet Valentine treat! What a darling teacup! Shelley makes such pretty teacups and each one is so special. The cookie looks good too. I must remember that wee tidbit about brewing the teabag a second time as I do not like my tea strong. Thank you for a pretty and interesting post, my friend. Happy Valentines day! 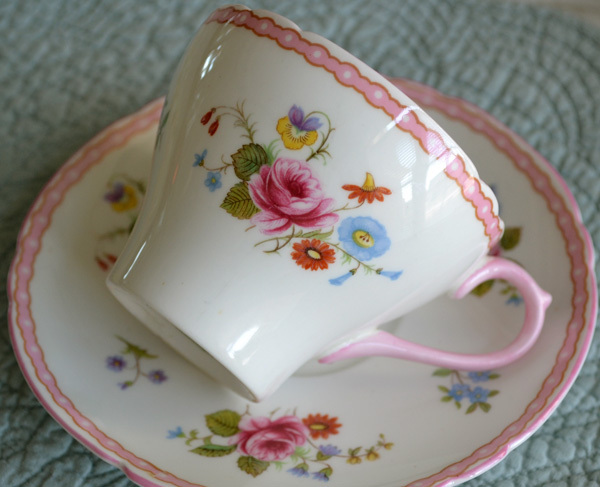 What a lovely cup and saucer - pink, blue and yellow are always so pretty! Beautiful cup! She really is pretty in pink! Speaking of caffeine...I've been off it for some time now...and the other day at a cafe...I forgot to say the simple phrase "de-caf" while ordering my coffee. I finished the entire cup before I realized what I'd done.....!! Needless to say, I was up awake the entire night. Yikes! Thanks for sharing tea cup Tuesday with all of us....I have enjoyed it from the start. I love the Teacup and Saucer set you have displayed. Such sweet flowers. The cookie looks delicious, too! Hi Terri. Of course I love your teacup! That's a favorite pattern in the New Cambridge shape and was made 1954-1965. They are so lovely! Your photos are alwasy so wonderful! Thakns for hosting! Thanks so much for the fun party...this is my first time linking up! The pattern on your cup set is so pretty. I love the pink! Love love love that teacup - what pretty pictures you have shared, Terri! Happy Tea Tuesday, my friend! Love this shade of pink and the blue little flower going to well with the pink. Thanks for the information link about Shelley. I always wonder why they come with such prices. your tea cup is lovely. It looks very feminine with the pink border and the cute flowers. 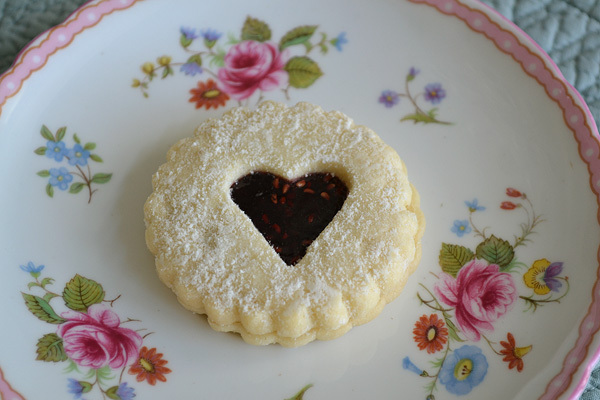 And the heart cookie looks yummy and so nice for Valentine's day. How interesting to learn about tea brewing and caffeine. I didn't knew that and will try it here. Thank you for sharing this all and for hosting this sweet event. I love reading the history of teacups, especially because the history so often involves far more than just teacups. What a lovely teacup. And I especially appreciate the info about the caffeine content in tea. 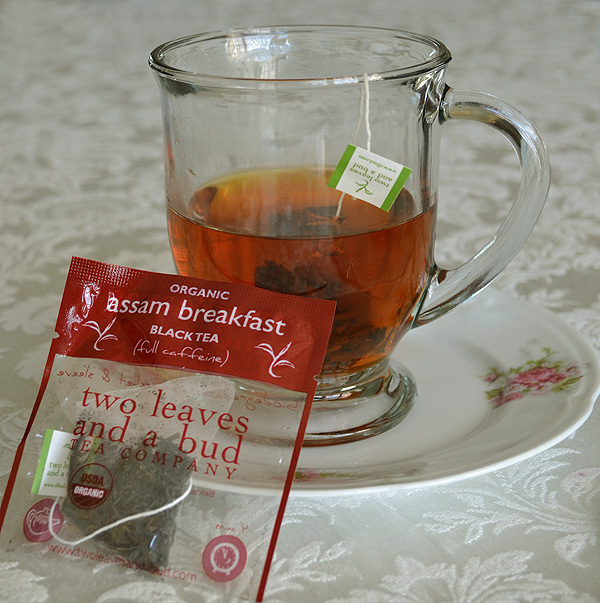 Hmm, now all we need to do is have someone to share tea with us, I'll take the very caffeinated cup please! Your cup is so pretty and fitting for this week in February....and the tea looks wonderful, I would take the full caffeine version though!!Hugs! 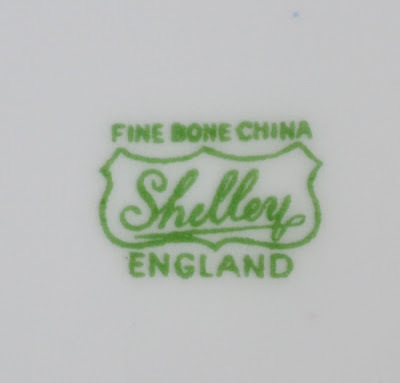 Your teacup is so pretty and thank you for sharing the info on Shelley. I think I love all of the teacups from that company. I love your darling Shelley teacup. I've been looking for one here in Florida, but haven't seen one so far. When my Mom and me have tea we always share the teabag. She likes her's strong and I need less caffeine. Thank you for hosting your party and have a wonderful Valentine's day. I love your teacup it is so beautiful. I have rejoined your Teacup Tuesday after some time away but I had difficulty with you Linky tool. I filled everything out properly and when I went to put in my thumbnail picture I have no clue what it did. but it listed my email address as my title and I really don't want my e-mail address out there like that - can you help by removing my link or something??? Help!!!!!! Your Shelley teacup is lovely, with that delicate pink border and the sweet flower decoration. And the heart-shaped cookies are so inviting! Thanks for hosting this delightful tea and for the tips about how to avoid caffeine in it. HI Terri..what a super charming cup..it sings with delicate-childlike-innocence..i love it..gorgeous dainty colors ..what a gem! Love the cookie beside it too..beautiful! thanks for always sharing such interesting info and history! Love black tea..yum! Gorgeous array of photos for teatime..thanks so much for lifting my day with beauty! Que bella taza!!! Muy romántica para festejar San Valentín. Acá en Argentina no somos de tomarnos en serio esas fechas, igual yo quise compartirlo, a mi manera. Muchos besos amiga, gracias por venir a mi casa. 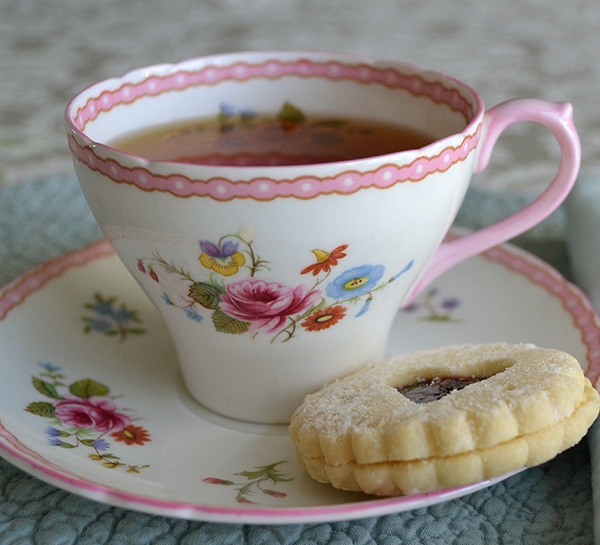 Love your floral teacup and saucer with the lace trim. Beautiful! Your valentine cookies are sweet. Sorry I'm late with my comment. I ran out of time and had to go to work. Thanks for hosting. Happy Valentine's day! Your pink corset teacup is really lovely. Aren't blogging friends the best? We have so much we can learn from one another. Thank you so much for you swift help in my plight. Hi, Terri...It's been a while, so I thought I'd pop in to say "hello" and see your lovely teacups. Yes, I agree this one is such a cheery, sweet thing. She puts a smile on my face just thinking about drinking a hot soothing drink from her. Your heart necklace is delightfully fab, indeed. I'm glad to see you are happily creating. Terri - What a great post this week! First of all, I think I'm really ready for spring so your selection with the spring colors and flowers was a true spirit lifter! Second - Shelley - *sigh* - but BOO to destroy all the molds??? What ails some folks with no respect for history and art! Now - the winner here has got to be this great new tip about the caffeine seeping out in the first 40 seconds of brewing. Clever trick, that! Must try sometime . . .
That's such a gorgeous and lovely teacup - perfectly spring-like! Our little coffee shop sells that tea - I have told myself to try it - next time I'm there I will! That is the sweetest tea cup, dear Terri, so sommerly, and your setting so beautiful. The cookie looks both yummy and lovely. And thank`s for the advice about the caffeine!